WINNER OF THE OFFICIAL C64 SEUCK COMPETITION 2015! 6 days ago: Deep Sea Research Station Crouch End 01 reports that core drilling has uncovered "samples of [REDACTED] far beyond our expectations." 4 days ago: Reports from Deep Sea Research Station Crouch End indicate an increase in magnitude of localised seismic activity that "has caused a section of the trench wall to fall away, revealing a great [REDACTED]." 3 days ago: Reports, occasionally confusing, speak of a malady that has struck down some researchers in the station causing hallucinations and severe paranoia. 2 days ago: Garbled and sometimes completely incoherent reports come flooding in from Crouch End. Panic, terror and insanity seems to have taken a hold of the entire research station. One communique speaks of marine creatures trapped, driven mad, mutated, and worse. Today: You get the call. As a Deep Sea Reconnaissance and Rescue Operative aka ABYSSONAUT, you have volunteered to brave the crushing depths and violent creatures, free any helpless marine life you find and discover what has happened to the Crouch End Research Station. You head out at once, plunging into the ocean on your DSRRO Manta class seascooter. At the title screen press the fire button to start the game. Control your Abyssonaut using a joystick in port 2. 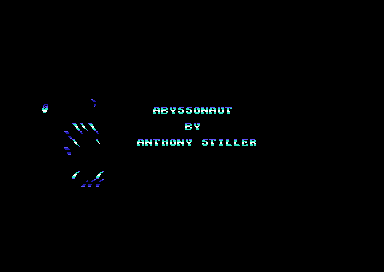 Unlike most side-scrolling shooters ABYSSONAUT scrolls from left right. During play, pressing fire unleashes one of the high explosive-tipped harpoons currently loaded into your twin harpoon launchers. Your harpoon launchers reload after a harpoon has either exploded or reached maximum effective range. As per DSRRO safety regulations only two harpoons can be 'hot' at a time. This game was created on a C64 emulator using the Shoot Em Up Construction Kit. 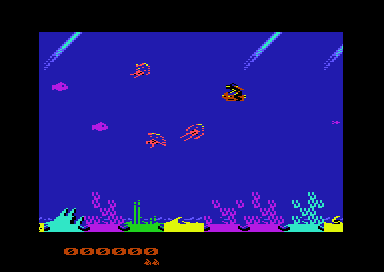 Press Fire at the title screen to begin. Extra life every 10,000 points.